Speed can mean many things when it comes to racing a motorcycle, and what one racer considers fast, another may feel is positively pedestrian compared to their chosen discipline. Regardless, one thing’s for sure: whether they’re racing across the desert, down the drag strip or around the track, speed is going to impact a rider’s body and mind and their ability to handle the bike. Take Dakar riders for example. During this grueling off-road race, the motorcycle riders can hit speeds of 110mph. 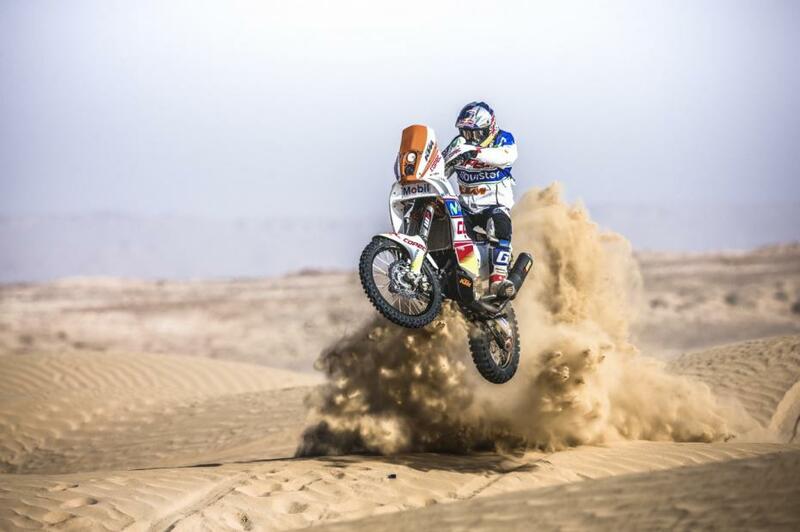 While, on the surface, this may not seem that impressive, especially to MotoGP riders who regularly top 200mph, Dakar riders are doing this in an off-road environment with jumps, rocks, sand dunes and even cattle crossing the dirt track ahead. When you add in the fact that some Dakar stages are 300 miles long and riders can be on the bike all day in temperatures that vary from sub-zero to cauldron hot, just managing to stay awake is a tremendous battle. The concentration levels required to process information on obstacles ahead (and read a navigation road book at the same time) while doing over 100mph when your body is shattered, is mind-bending, and that’s what makes Dakar such a stern test. It’s not the speed that will get you, it’s the smallest slip in concentration, caused by sheer mental and physical fatigue when your body is running on empty. 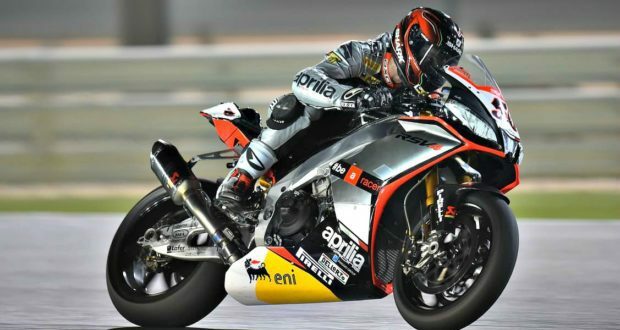 MotoGP riders however, have a completely different battle on their hands when it comes to dealing with speed. Circuit racing is all about fractions of a second so the rider’s physical size can have a huge impact on lap times. With a height of 5ft 2in and a weight of 51kg, it’s no surprise that Dani Pedrosa, one of MotoGP’s leading riders, is renowned for his lightning starts. MotoGP bikes are restricted on their minimum weight, but this figure doesn’t include the rider (unlike Moto3 where the weight of both bike and rider is combined). Because of this, Dani’s small frame gives him a significant starting advantage over someone like Valentino Rossi, who is about 5ft 10in and 67kg. This isn’t the only performance advantage Dani’s size gives him. He is also able to tuck behind the bike’s fairing and screen better, making him more aerodynamic thus giving him a faster top speed on the straights. In effect, Dani’s small size gives him extra horsepower for free, but being small isn’t always good news in MotoGP. Crashing can of course be a major hazard and Dani’s smaller body does seem to be more susceptible to injury, whereas larger and more muscular riders often bounce. Current MotoGP world champion Marc Marquez, who is 5ft 5in and 59kg, appears to have an incredible ability to bounce. He even walked away from a 209.9mph crash at Mugello with no more than a cut on his chin. A lot of people suggest Marc’s extra mass is mainly core strength muscles and it is this that is protecting him, but it could all just be down to luck! However, when you are talking core strength and the effect of speed on body parts, you really need to look at Top Fuel drag racers. 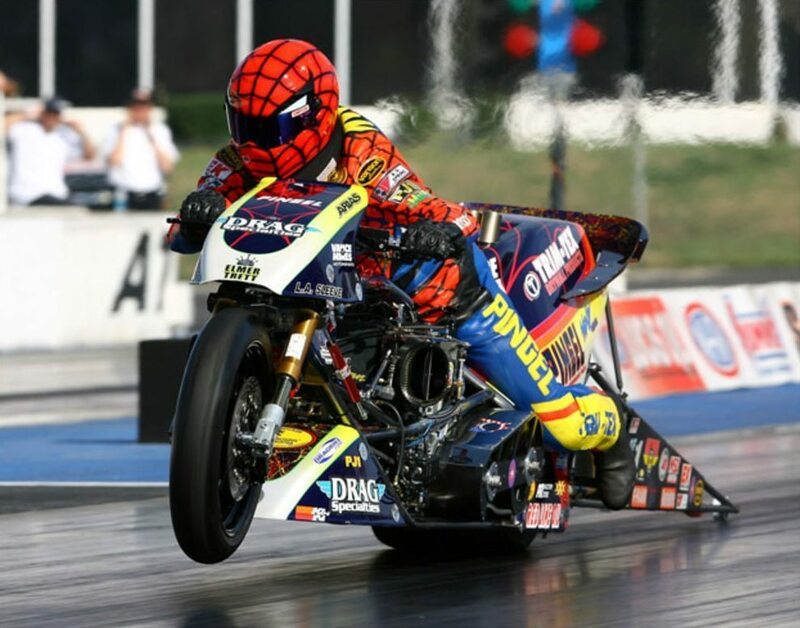 Top Fuel are the fastest accelerating bikes on the planet and one man who has become a legend in the scene is US racer Larry ‘Spiderman’ McBride. Atop his 1000 horsepower 1511cc bike, Larry smokes out a quarter of a mile in just 5.809 seconds with a terminal speed of 248.66mph. In just over a second, his bike reaches 100mph and his best eighth of a mile run took just 3.877 seconds. With 14 world titles and a career spanning 37 years, Larry is rightly famous. However, Larry also gained notoriety for the rumour that he has done so many drag races that the force of the acceleration has caused his internal organs to shift place by a few inches! Sadly, for a good story this is simply a rumour and all of Larry’s organs are still located where they should be; unlike US car Top Fuel drag racer Don Garlits, who was forced to retire from the sport after suffering detached retinas due to the rapid deceleration at the end of the run caused by the parachutes used to slow racers down! There have also been cases of drivers passing out due to the g-forces, but thankfully this generally doesn’t happen on bikes. That said, a drag bike’s engine is covered in a Kevlar net/strap and some riders wear bulletproof jackets when they race. A good thing too, because if the engine exploded (a fairly regular occurrence), the pistons can be fired out directly into their chests as they are leant over the bike! While all these examples are very extreme, road riders can certainly take away valuable lessons from them when it comes to understanding the effect speed has on the body, some of which are demonstrated in this animation. From blood rushing to and from the head, which gives a sense of exhilaration, to muscles and bones being squished and squashed, quite a lot happens when you accelerate and decelerate. So, in case you’re thinking of heading off to the desert, or want to give the drag strip or racetrack a go, be aware of what will happen to your brain and body when you pull off, overtake or brake. And that applies to when you’re riding to work or touring at the weekend too. 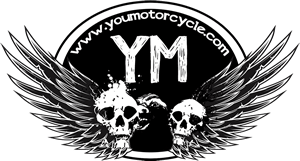 Next: In a World of Alternative Facts, Should You Trust Your Motorcycle Magazine? Very interesting. Really impressive details about how a riders weight and speed especially about MotoGP riders could impact on riders body.